Over the years, custom built bikes and their makers have gained considerable popularity as well as great business opportunities. Social Media is abuzz with images, videos, and stories of customized bikes with mechanical updates as well as the cosmetic ones. In this blog, we do not bring any customization techniques or other related know how’s. Rather we have come up, with a list of customized bikes that has their makers name written all over it. So rollback and feast your eyes on these marvels born not out of the confines of modern day production factories, but from the toils and sweat of some crazy and out of the box thinkers, who just want a little bit of their own self in their bikes. Let me help you rolling your eyes over the best-customized motorcycles of this year. 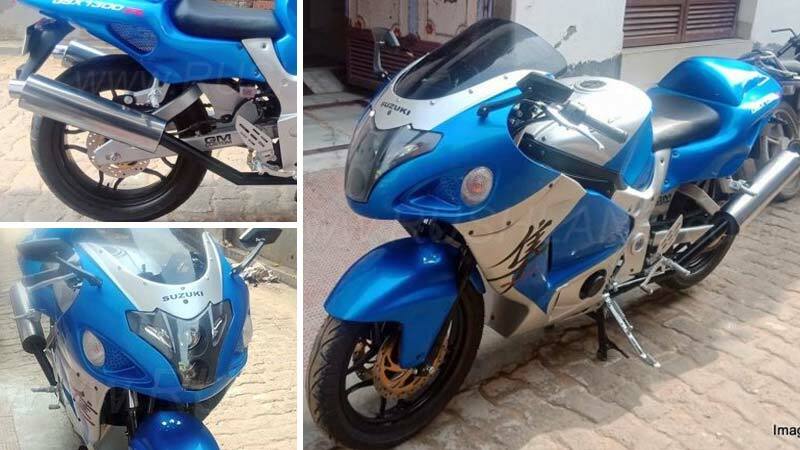 Delhi-based GM Custom which had already brought out sorts of unbelievable customization’s, now come up with Bajaj Pulsar turned into an old gen Suzuki Hayabusa. The bike looks that original that even a trained eye could not find about the bike at a glance. The modified Hayabusa is packed with a body kit and an extensive range of spares sourced of Hayabusa. Even the wheelbase has also been managed as like the Hayabusa. The stocked Pulsar bits like the thinner telescopic front fork, smaller twin discs at the front, foot pegs, Pulsar 220 headlight and a light duty chain sprocket set can’t even be spotted in casual sight, which showcases an extensive modification with controlled hands. In order to get this mod, you have to shell out money in the range of INR 2 lakhs. The custom bike maker 16 Performance that is renowned for presenting extensive customization on Royal Enfield bikes, now bring an amazingly customized RE Classic 350 which will remind of premium cruiser bikes like the Scout Bobber and the Harley Davidson Fat Bob. At the fascia, the customised Classic 350 gets a unique headlight design with LED fog lamps along with the thicker front suspension. A front mudguard is also a customized unit as the stock one was not seen that compatible with the changes. The equipped fuel tank design seems inspired from the above mentioned big names so that it can match up with the bulky body panels. Furthermore, the other components which are retrofitted to the motorcycle include a unique pair of the rim which gives the illusion of white wall tyres with its black inner and silver outer section. In addition to that, there are well padded sculpted with a rear backrest for better comfort. Other bits which complete the customization are an extra wide handlebar, disc brakes at both end and a custom swing arm for increased overall length. 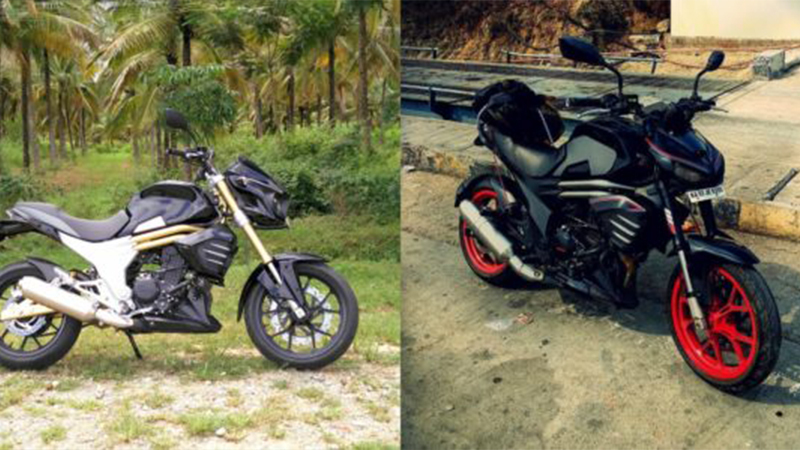 When it comes to customization, Bajaj Pulsar 220 is amongst the most preferable bikes in India. The model has undergone modifications much time but this time it gets into the skin of a supermoto off-roader. In order to get this silhouette, almost every part of the Pulsar 220 has been changed. It now based on a new chassis that along with other newly added body parts completely changed the motorcycle’s profile into a more modern and adventurous option. The bits such as the handlebar, tank and seat design are all new while the bash plate draws design inspiration from the Honda CBF250R. The suspension duties on the Pulsar 220 turned adventure will be handled by the front and rear suspension similar in design with the Kawasaki KLX 150. For braking, the stocked solid disc is replaced with larger petal discs at both the front and rear wheel. It stands on the KLX150 sourced spoke wheels which are wrapped in the road going high grip tyres. Furthermore, a chain tensioner and under seat dual exhaust setup are the major highlights of the bike. This unbelievable makeover costs INR 2 lakhs. 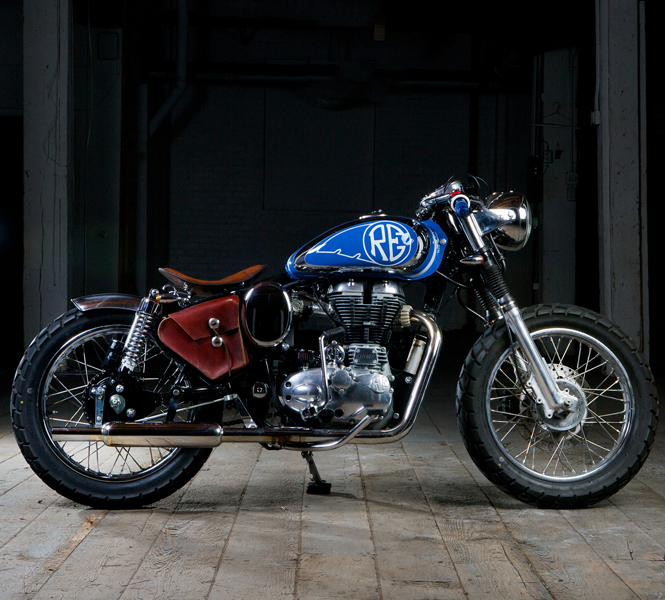 A Royal Enfield Bullet 350 has unbelievably transformed into naked sports. As the person behind this customization only utilizes the powertrain of the stock motorcycle that can instantly be recognized by the RE Logo. furthermore, no bits from the Bullet 350 are taken to craft this naked sports. The motorcycle uses shared fuel tank from any regular naked motorcycle, while the attributes such as the tank extensions, two-piece seat, mudguard and tailpiece seem hand-made or borrowed from small capacity motorcycles not available to purchase in India. Furthermore, a host of custom-made components are also added to the motorcycle so that they can be compatible with the RE chassis. Other features include upside-down front forks, street-fighter friendly flat handlebar, alloy wheels, edgy exhaust canister, etc. The custom-mod is painted in silver, grey and blue colour theme. Powering the motorcycle is the same 350cc single-cylinder stock unit. The mill is rated to churn out 19.8bhp and 28Nm of torque via a mated 5-speed unit. Though, it was tuned to perform hard for the naked sports. The builder claims post adjustments, the engine is able to beat the KTM 200 easily. Yamaha R3 that has been proved itself a great canvas to showcase artist’s creativity via the AMG edition of the MV Agusta F3. Now once again chose to give it the Yamaha YZF-R1 M appearance. 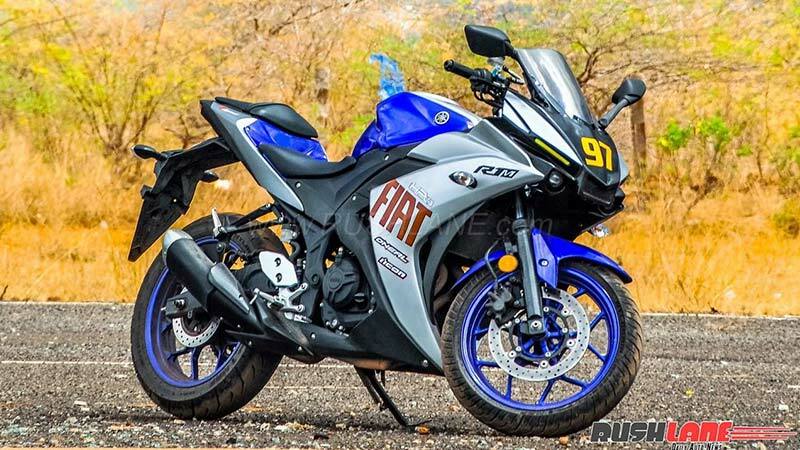 The changes which are introduced to make the bike look like the Yamaha YZF-R1 M are wraps and decals that offers Yamaha’s trademark silver-blue combo. Furthermore, the mod now features HID projector headlamps with LED daytime running lights that resemble the R1 M.
The bike stands on a new diamond-shaped tubular frame that is mounted on the telescopic front fork and rear monoshock suspension system. Braking is handled by single disc brake at both ends. While the wheels are wrapped in Metzeler Sportec M5 tires of measure 110/70R-17 (front) and 140/70R-17 (rear). A custom specialist Neev Motorcycles from Delhi transformed a Royal Enfield Thunderbird 500 by following design bits from the power cruiser Ducati Diavel. The custom mod is entitled as the Godzilla. 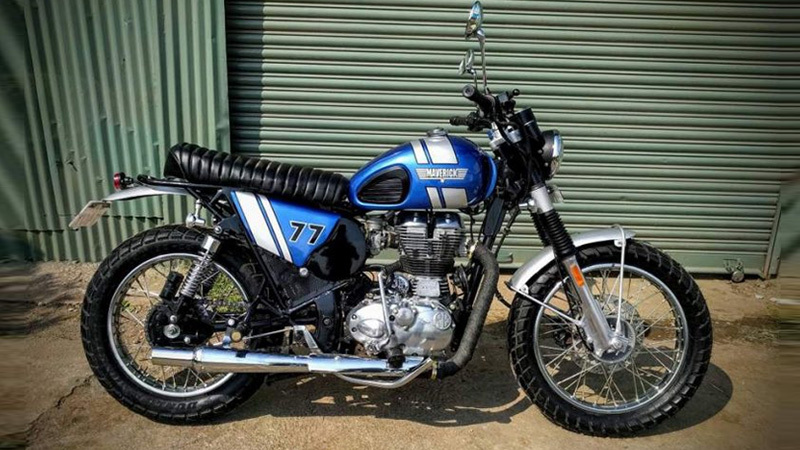 To get into this form, the RE Thunderbird 500 undergone vital changes. It gets new headlamp design and several handmade components in order to obtain Diavel essence. The revised front forks are made of aluminium and slightly longer than the stock one. The handlebar is wide while the fuel tank is a stretched unit that makes it more capable of touring. In addition to this, the Godzilla gets specially designed covers on the engine front and side. Also, the sprocket and swingarm are fresh units designed to resemble being used in the Diavel. It gets right side positioned chain as against to the opposite side of the stock bike. The powertrain is all similar 499cc engine unit that churns out 27.2 bhp via a mated 5-speed gearbox. One look at the Mahindra Mojo 300 and we bet that even the original designers of the bike would stand up and applaud the effort and vision of the owner. Inspired by the Kawasaki Z1000, the makeover perfectly incorporates the ZEN inspired Japanese design principle. On the design front, the sharper fascia adds new feathers to the erstwhile humble design of the Mahindra Mojo 300. If it would not have been for the Instagram account @iamabikerdotcom, this design masterpiece may not have made it to our list. The front designs coupled with the all-new WP made telescopic front fork blend perfectly into the fuel tank. Under the hood, a 294.7 cc liquid cooled single cylinder engine drives the custom designed body. It churns out 26.82 bhp of power at 8,000 rpm and 30 Nm of torque at 5,500 rpm. The folks at @iamabikerdotcom have been spot on with their choice of graphics. The black body with fiery red stripes strikes a perfect resemblance to a fiery panther. The plastic claddings enveloping the radiator are dipped in neat red stripes. The makers have not gone overboard with the cosmetic makeover. The rims also get a mild makeover, adding a pleasing contrast to the all black body panels. If there was any bike that deserved to be on the list then it was this. Aseem Singh Pawar of Inline3 Custom Motorcycles has put his heart and soul to make this cross between KTM Duke 200 and Yamaha Yamaha RD 350 a reality. The RD Duke is an RD 350 engine housed within a KTM Duke 200 body. Mounting the RD 350 engine was never going to be a child’s play. However, with a little help from the local experts, Aseem achieved the feet in 3-4 months. A look at the list of insane performance parts imported from the US and you will be raring to check the power and performance of this two-wheel monster. The imported list of parts include: silicon coated performance pistons, performance crank rods, high-performance pressure plates, hydraulic clutch, US barrels (standard size), VForce 3 Reed valve, VM32 carburetors, K&N filters, DG head, CNC milled clip-on handlebar, Jim Lomas SS Expansions and last but not the least a power dynamo. It took more than a year to get the beast up and running. The red hooligan enters a zone of its own once it touches 7000 RPM mark the modified bike. 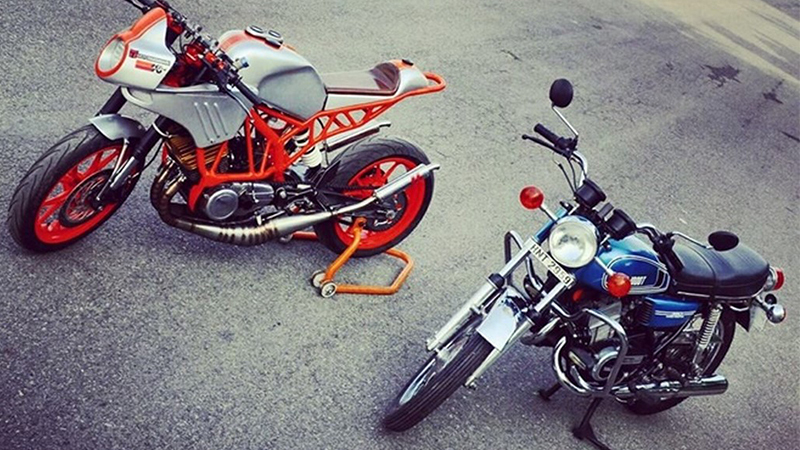 This prompted the maker to call this Modified KTM Duke 200 beast “The Flying Sikh”. Check out the pictures below to get a feel for this baby from the Chandigarh-based Inline3 Custom Motorcycles. 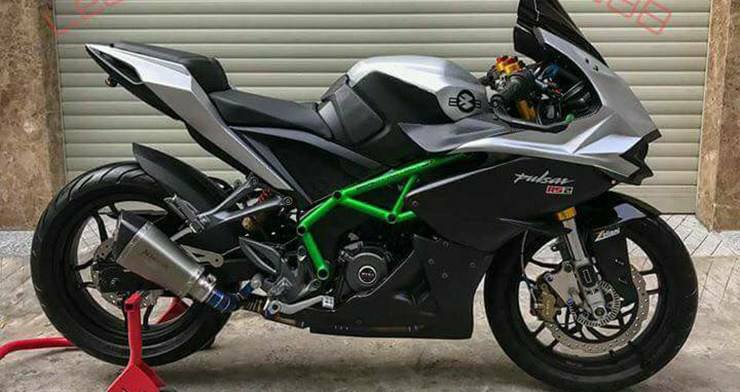 Vietnam-based Leeat Moto transformed Bajaj Pulsar RS200 into a belligerent monster by opting design inspiration from the Kawasaki Ninja H2. post customisation, the Pulsar RS200 received more aggressive front fairing integrated with taller windshield, altered headlamp assembly that contains the main headlamp at the centre along with red turn indicators alongside. As well as, the tank extensions that uses carbon fibre accent are extended units now on Pulsar RS200. Painted in dual tone silver black shade, the motorcycle obtains a trellis frame (finished Kawasaki Green) add-on to the existing one. The custom bike now contains bulbous USD front forks, two-piece clip-on handlebar and an Akrapovic exhaust system. Propelling unit is likely to be the same stock unit as no update at performance front revealed by Leeat Moto. A Delhi based custom shop called Indian Choppers has done a great job on Royal Enfield Classic 350/500 to create this Rogue. All the customization on the bike is done by Kamaljeet Singh also known as Bobby Singh. 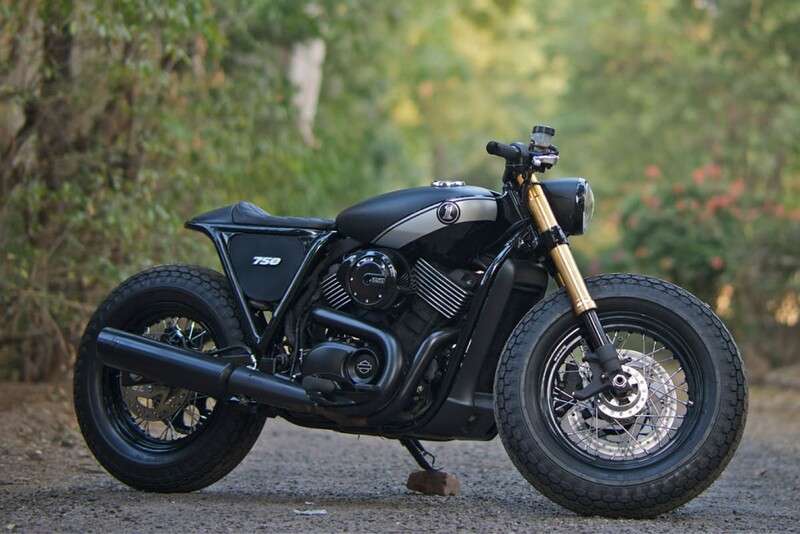 The major attraction on the Rouge is 360mm wider rear tyre that is claimed as the world’s heaviest bike tyre along with a 200mm wide front tyre. Other than this, the muscular, painted in red RE Rouge gets customized wheels, full metal body, hand-built V-Twin engine dummy. While no changes had been made on the engine and gearbox. 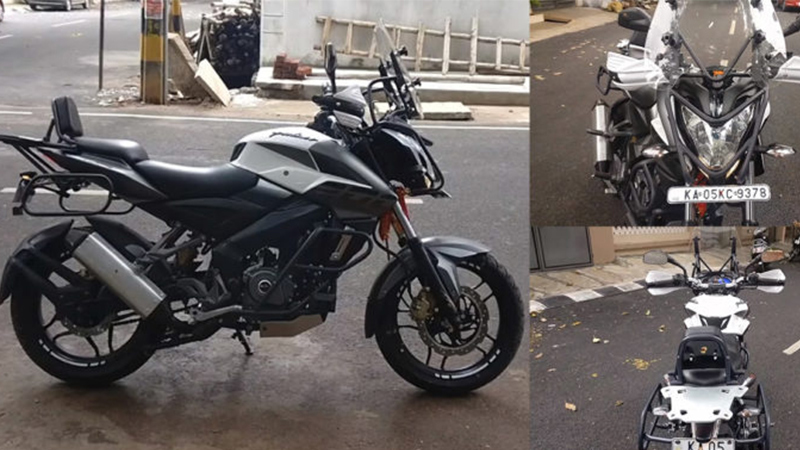 The bike is a just modified version of NS200 in wild phase and somewhat inspired by Triumph Tiger’s features but the size is small comparatively and so the price. The bike has got a new explainable crash guard protection. 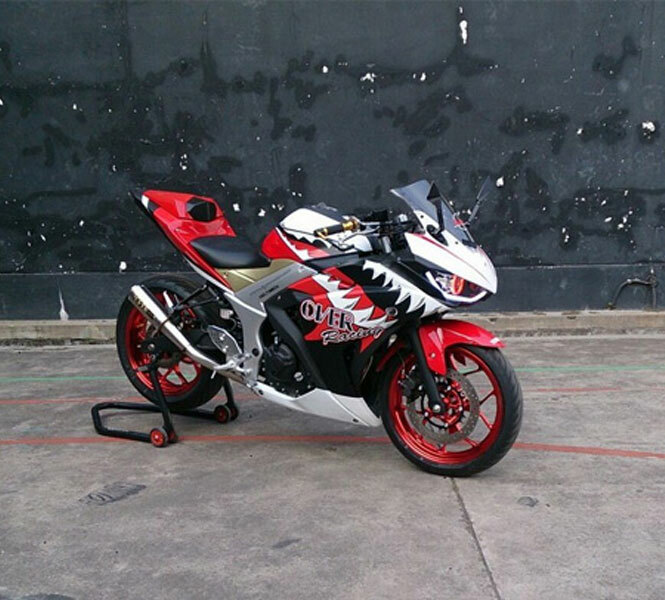 The customized bike clothes a widescreen which is adjustable in height, protecting knuckle-guards, a combo of saddle-stays, a backrest for pillion and a top box mounting plate. The stock under-belly unit is revised with an installation of an aftermarket exhaust with aluminium casing. The handlebar got the new KTM 390 Duke source unit in replacement of a stock clip-on handlebar. The revision in the bike has resulted in increased weight by 8-12 kilograms. To accommodate with the weight, the bike gets a BMC air filter in collaboration with an aftermarket exhaust in order to improve the bike performance. Delhi based GM customs has done a commendable job on a Hero Karizma by transforming it into a most popular hyper sports bike, Suzuki Hayabusa that you must be baffled completely. 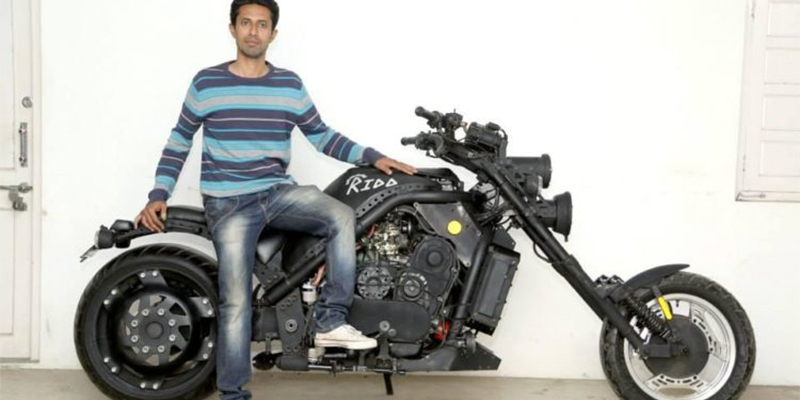 Showcased in Bollywood’s popular movie Dhoom, the sports bike has a massive fan following. To getting Hayabusa avatar, the Hero Karizma ZMR has gone through major cosmetic updates from tip to toe. From entire body panels to front fairing, fuel tank, rear seat cowl integrated with tail light are shared from Hayabusa. 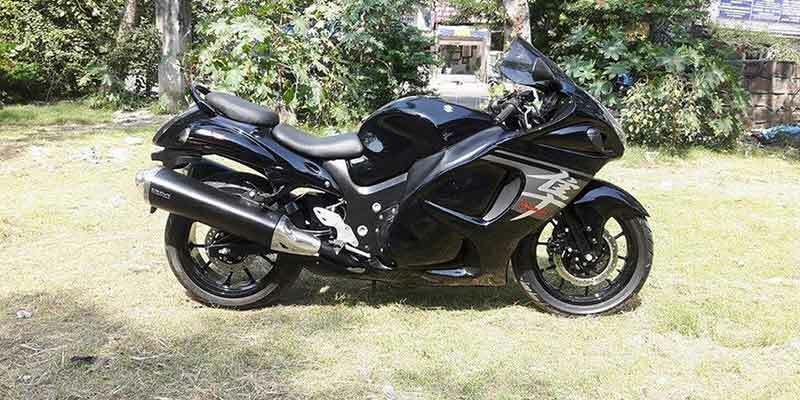 Other than this, bits included twin large exhaust, wheels and the tyres are also from Hayabusa. Handlebar featuring Hayabusa logo, replica instrument cluster, suspension setup comprising telescopic front fork and rear monoshock mounted on custom swingarm are also reworked bits along with disc brakes on the bike which has one dummy unit at the front while the rear is a stock unit. Stocked 223cc oil-cooled and fuel-injected engine, mated to a 5-speed gearbox churn out 20 HP and 19.7 Nm of torque. 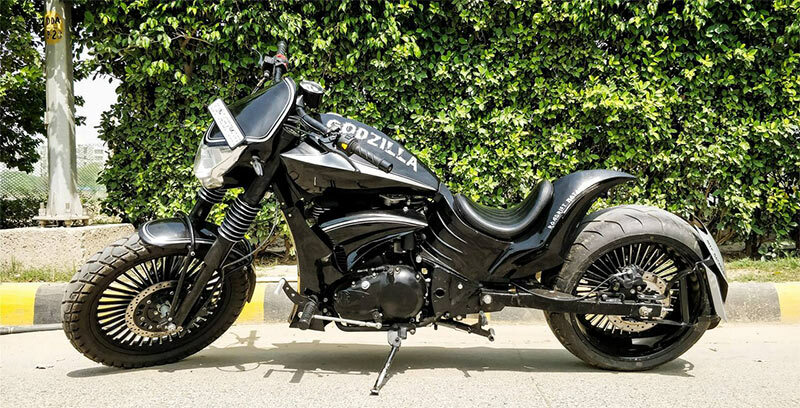 Ground Designs, a custom shop from Pune that is renowned for customizing both the 2 and 4-wheelers, has done an offbeat transformation on the Bajaj Dominar 400. The sports bike has been altered into an off-roader with the introduction of attributes from adventure bikes. The turned adventure Dominar 400 now gets raised front suspension with 90mm extended travel, raised front fender, black headlight cover, fully transparent windscreen, and knuckle guards at the front end. Other than this, the neon green painted alloy wheels which grabs instant attention are also there. An after-market crash bar with fog lights has succeeded the stock engine crash guard. The 400 decals next to the perimeter frame also dipped in a same neon green colour of the alloys. While the rear gets the fitment of luggage panniers and an off-road specific dual purpose tyre for better grip onto the uneven terrains. There are no changes at the powertrain end, the stock engine continues to perform propelling duties. The 373.3cc single-cylinder, fuel-injected, liquid-cooled engine is rated to generate 35 HP of power and deliver 35 Nm of torque to the rear wheel with the aids of a 6-speed gearbox. Bulleteer Customs, a bike customization house has transformed a Royal Enfield Continental GT into a retro cafe racer by adding a host of unique accents. The custom bike is entitled as the Agastya and is a thoroughly overhauled iteration. Start with the front, the bike gets new round shape headlamp with chrome bezel and single pod instrument cluster with chrome. Other than this, the fitment of drag-style handlebars accentuates the cafe racer appeal. Moving ahead the bike is equipped with a more muscular modified fuel tank unit and a long flat seat to add a retro effect to the bike. 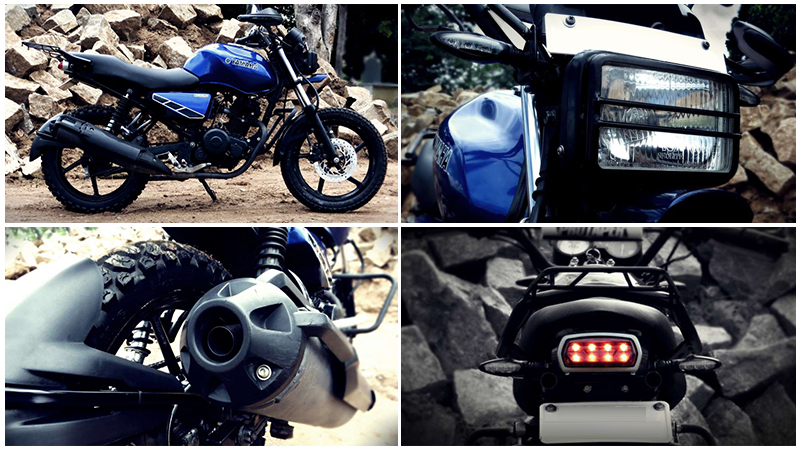 At the rear, an LED strip, blacked out exhausts and a new tail lamp is adding an offbeat attraction to the bike. 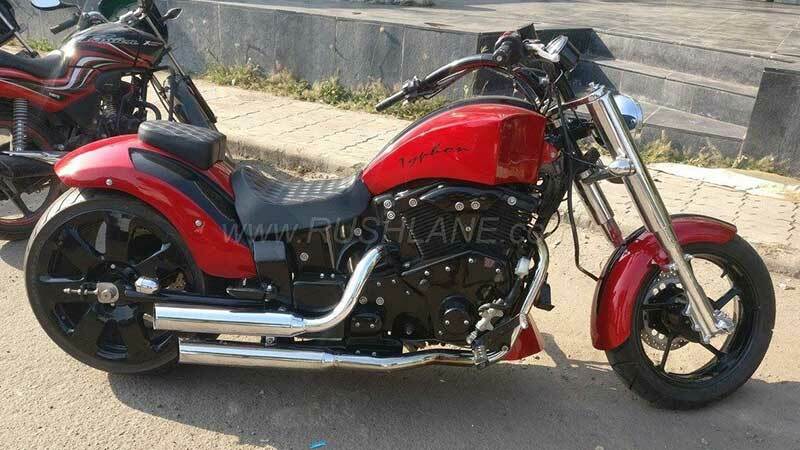 In addition to that, the custom bikes maker has also replaced side body panels of the Agastya. Promising mechanicals includes disc brakes at both wheels, gold finished USD front forks and custom rear shocks. The bike will run on premium black alloy wheels wrapped with the Pirelli Sport Demon tyres for extra grip. While, regarding powertrain, there is no confirmed information as the Bulleteer Customs has made any changes to the drivetrain or not. While the stock unit on the regular model is a 535cc single cylinder, that is rated to churn 29.10 bhp peak power at 5,100 rpm and 44 Nm torque at 4,000 rpm mated to a 5-speed gearbox. 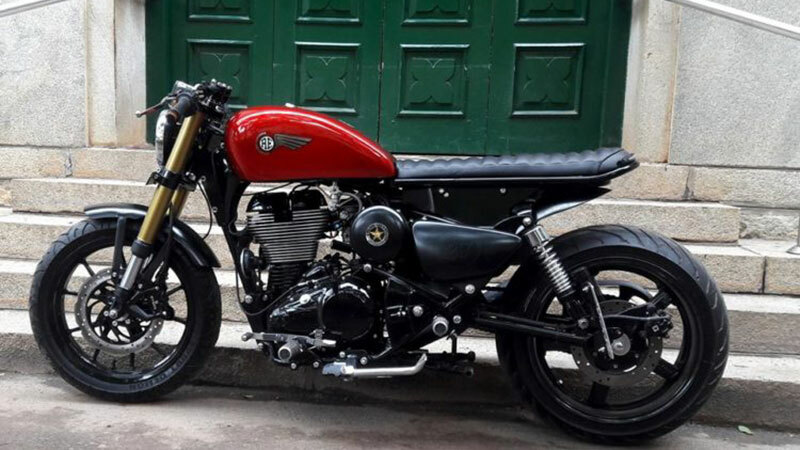 A Hyderabad based motorcycle custom shop, Eimor Customs gave a meaner makeover to the Royal Enfield Thunderbird 350. That is named as the Quick Silver as equipment proves the value of name includes unique metal-flake painted fuel tank with contrasting black 3D tribal flames and white hand pin stripes. 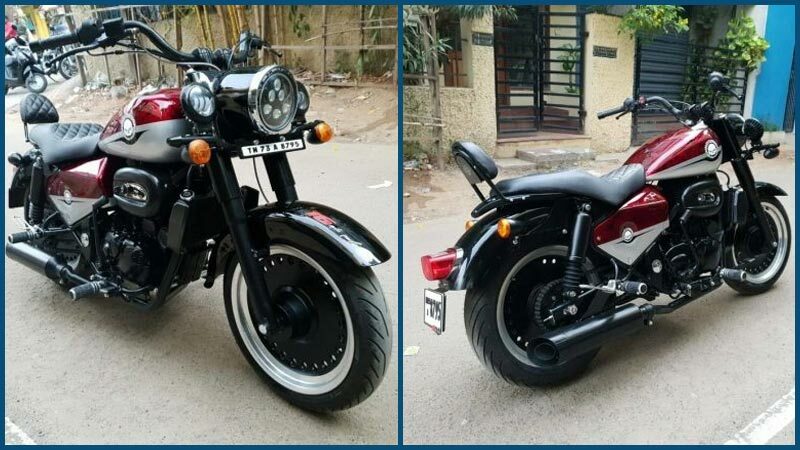 Other major highlights comprise raised straight bars, bar end mirrors, well cushioned single seat, fender-mounted luggage rack, fatter tyres, 4-inch twin pod headlamps and for riding-related information twin instrument cluster. For extra visibility at night, the bar type crash guard is fitted with twin auxiliary LED lamps. Under the fuel tank, the packed 346cc single cylinder twin spark engine performs propelling duties. In Association with a 5-speed unit, the engine is claimed to churn out 19.8bhp of peak power at 5,250 rpm along with 28Nm of torque at 4,000rpm. The RE-500 Basic is an attention-worthy minimal Royal Enfield Classic 500‘s iteration by a renowned custom bike builder from Rajasthan, Rajasthan Customs. With a simple chrome tank and a matte black body paint, the motorcycle will make you remind of simple motorcycling days of yore. Furthermore, it gets a stock front telescopic fork with gaiters, stock rear shock with black paint. A custom saddle which appears comfortable is integrated to the frame without the seat springs. Leaving the tank and seat the blokes, complete bike is blacked out. It uses dual-purpose MRF tyres, and suspension mounted points fitted rear indicators, which flank the minimalistic chopped fender. The bike gets Moto handlebars, stock disc brakes of 280mm and 153mm at front and rear respectively. While the mechanical includes in-stock 499cc single cylinder engine that makes out 27.2 bhp of power at 5,250 rpm and 41.3 Nm of torque at 4,000 rpm. The engine is anchored to a 5-speed gearbox. If you want this kind of modification, you have to left the bike at Rajputana Customs for four weeks for this particular build and have to spend INR 1.5 lakhs modification cost. Bajaj Pulsar NS200 which has been highly popular among biking enthusiasts has gone through a customization from an aftermarket specialist Motorland Customs. The alteration done on the bike is only limited to the cosmetic front as the custom mod is powered by the same company provided 99.2cc, liquid cooled, single cylinder engine. The motor in integration with a 6-speed transmission is rated to put out 23.5 bhp and 18.3 Nm at 9,500 rpm and 8,000 rpm respectively. 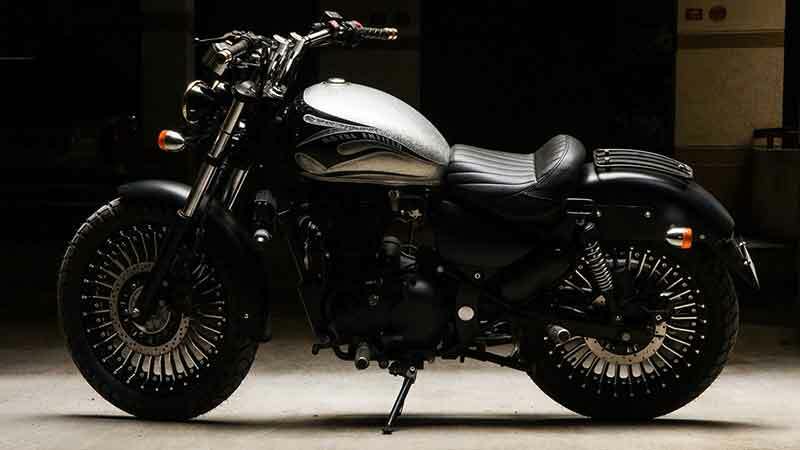 Visual upgrades on the NS200 custom mod Scrambler include a matte black colour scheme with metal sheet bodywork, K&N air filter, distinctive handlebars, and exhausts. Other than this, it also gets new indicators, headlamp, shared speedometer from Avenger while the rear wheel with tyre design is from Royal Enfield Himalayan. The single seat design receives ribbed stitching accents while the blackened colour scheme continued to the fender, front forks, tank, and seat. Beast Motors, a custom bike manufacturer, in association with R K, modified a Bajaj Pulsar 150 into the fastest monster with the top speed of 132 Kmph. The made changes on the bike are not only on the aesthetics but also at the drivetrain front also. The Visual changes on the Pulsar 150 mod include the employment of twin front LED lights with round headlamp, new custom windshield, custom cage under the front seat and red accents on tank shrouds, well-cushioned seats for rider and passenger, etc. Beneath the fuel tank, the engine has been redesigned and rebuilt for better power output and performance. The 168cc which now received new valves, valve seat, high-quality bore and iridium spark plugs, now generates 18 bhp peak power and 16.5 Nm torque. The new instalment helps bike to reach 0-100 just in 7.5 seconds. Altogether, the Beast Motors has also legally registered the “B3.1” with the RTO along with all the modifications. Yamaha SZ, which is a sports commuter from the Japanese bike maker, has gone through a customization to become a dual purpose motorcycle. Reportedly, a biking enthusiast, Dhruv, after meeting with an unfortunate event, transformed its Yamaha SZ into a dual purpose motorcycle. 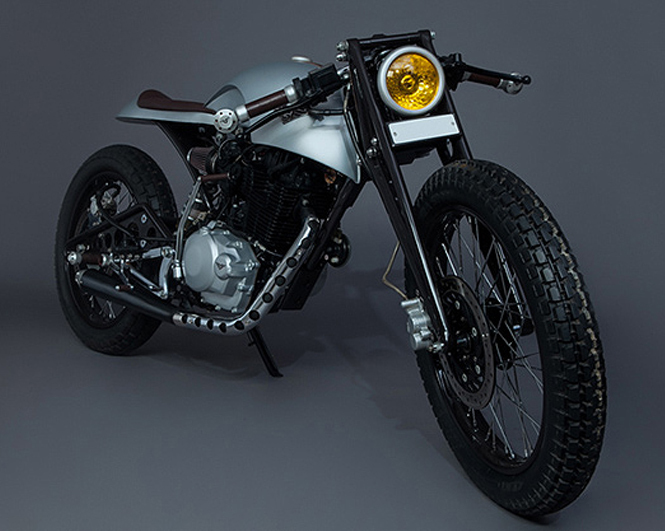 The bike took six months of hard work to get this tough and enduring incarnation. The owner overhauled its bike from tip to toe, but the major and noteworthy changes encompass Eicher truck headlamp protected by a fabricated grill, tall set handlebar with aftermarket handguards, replaced mudguard and gear shifter, redesigned seat, renovated mudguard, LED taillight, welded luggage rack to stock grab rail, off-road tyres and many more. In the next phase of up gradation, Dhruv will modify the engine, and suspension setup to improve off-road ride quality. TVS Scooty Pep+, has got an off-beat transformation as a Bangalore based custom bikemaker, dressed it in an orange outfit of KTM Duke 125. Look wise, an attention grabber, this TVS Scooty Pep+ mod is much influencing than the recently modified Honda Navi into a mini-Duke. To get this Austrian roadster avatar, the scooter has gone through a lot of efforts. At the fitments, It underpinned a tubular trellis frame, last generation KTM Duke’s headlamp, handlebar, body panels, underbelly cowl, an aftermarket exhaust canister, etc. To get this mod, you have to spend between INR 55,000-60,000 and it is available in orange, white and black colour options. Already an offbeat creation from Honda, the Navi which is renowned as ‘Monkey Bike’ across India, has got a visual makeover of KTM Duke 200. 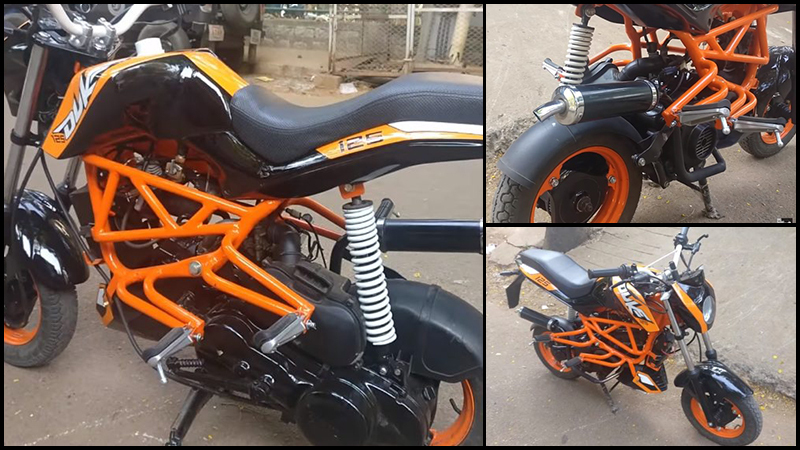 An aficionado from Hubli, Karnataka, has crafted all its creativity on its own Navi to give it a baby KTM look. The alterations on Navi are the Duke 200’s tank extensions, headlamp, headlamp cowl. Altogether, it shares the Duke 200 livery as well. Other modification includes an aftermarket exhaust, bespoke split seat and custom-made handlebar. At powertrain end, there are no changes, the Navi as Baby KTM will get propelling power from the same Honda Activa’s 102-cc four-stroke, single cylinder engine that churns out 8bhp of power along with 9Nm torque. The power will transmit through a mated CVT gearbox and can make this 101kg customized Navi run to attain a top speed in 80-90kph. 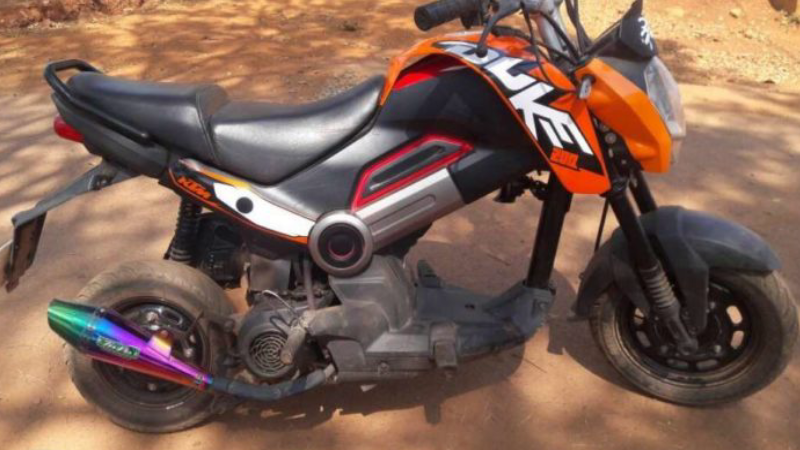 This bizarre creation is available to purchase on OLX at just double of Honda Navi ex-showroom price, which is Rs. 39,848. 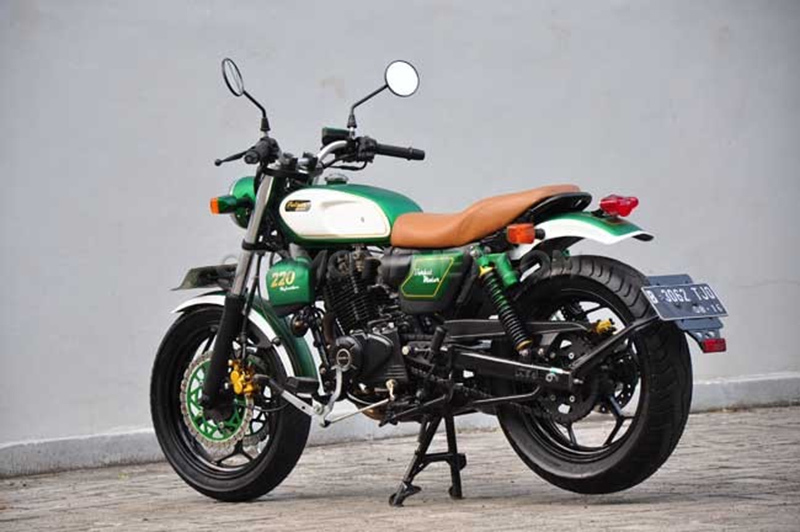 DC Design, a well-known Indian design company that has done marvellous customization work on popular cars and bike in the past is now ready with the customized version of the Royal Enfield 350 under the name of a new sub-brand DC2. The sub-brand will provide top end parts for the motorcycle that will be made of glass, metal, carbon fibre and magnesium. The Carbon Shot bike will be the first offering from the brand in the DC2 line-up. The Carbon shot features amazing characters like all-LED headlamps and front indicators with billet casing, and a carbon fuel tank cover on the base Royal Enfield fuel tank with real billet, chrome, and real carbon. The use of carbon coating can be easily seen on the front and the rear fenders. The single steel rider seat gets high-quality leather as well. The battery cover is also made up of the billet aluminium and carbon. Ridd- a 1000cc chopper, is a marvellous illustration of handmade motorcycles and for being India’s first handmade performance bike, it has also been listed in the Limca Book Record and also been appreciated by the Trend Setter award from the Gujrat Innovation Society. Mr Riddhish Vyas from Rajkot, Gujarat has built this performance oriented machine, most of its components are handmade. It took a long duration of eight years and costs the one-third of the available superbikes price from foreign manufacturers in the Indian premium biking sector. Include Triumph Motorcycles, Ducati, Kawasaki, Benelli, MV Agusta and others. Equipped with a derived 1000cc car engine, the motorcycle is claimed to attain the top speed of 170kmph with the aids of armed 6-speed gearbox transmission through a shaft drive. Welcome the world’s first customised BMW G 310 R designed in Japan. The Japanese designer named Takashi Nihira runs a shop named Wedge has made efforts to transform the standard G 310 R naked street bike into a tracker styled bike. Looking closely, it appears that the designer has changed all the components with the custom parts. The custom-made components include rear swing-arm, Subframe. The 17-inch standard wheels have been changed with 19-inch wheels. The other prominent additions are the K&N filter, new fuel tank, new radiator, new battery. According to Nihira, the bike is good for riding in the city. 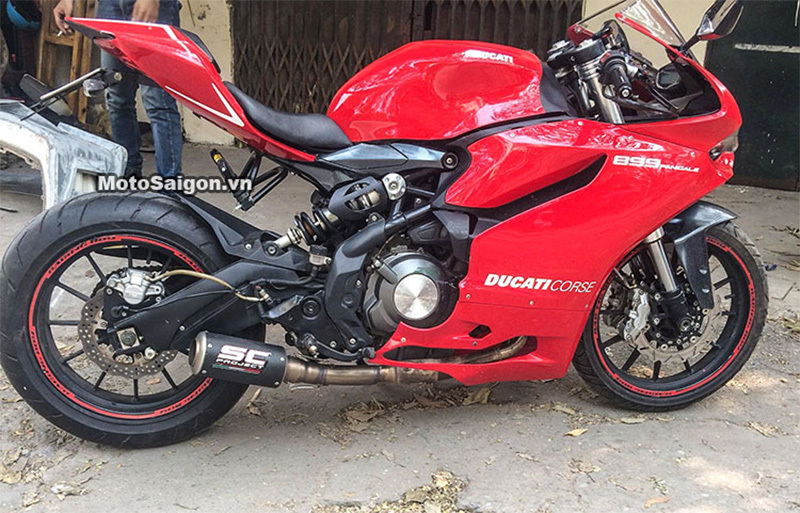 Benelli TNT300 has been transformed into an aggressive looking beast named Ducati Panigale. 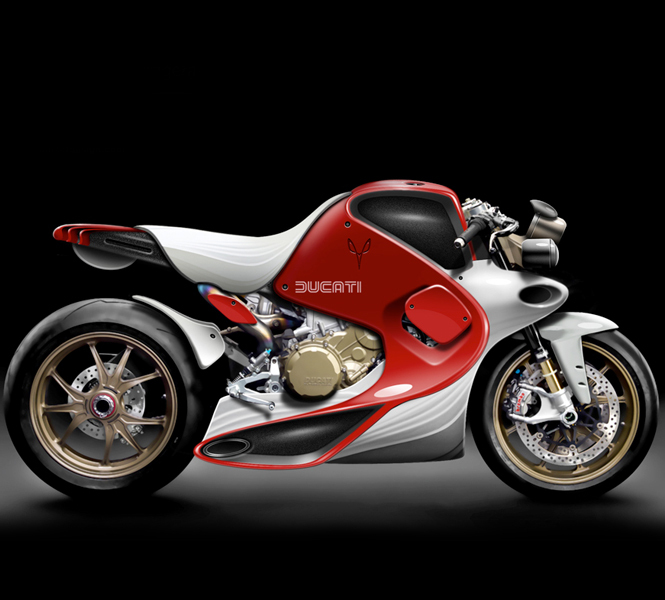 The customized bikes share a close resemblance with the Ducati 899 Panigale. If we look closely, the engine sectors and the swing-arm looks a bit more tweaked. Panigale’s full fairing remains the same with the LED headlamps. The original fuel tank has been completely changed with the original one sourced from the Ducati Panigale. Moving over to the tail section, the seat and the front fender are close enough to the Ducati. The engine remains same that is 300-cc, liquid cooled, parallel twin motor that develops only 38 bhp while the Ducati 899 Panigale comes with an 898 cc L-Twin engine that delivers 146.1 bhp. 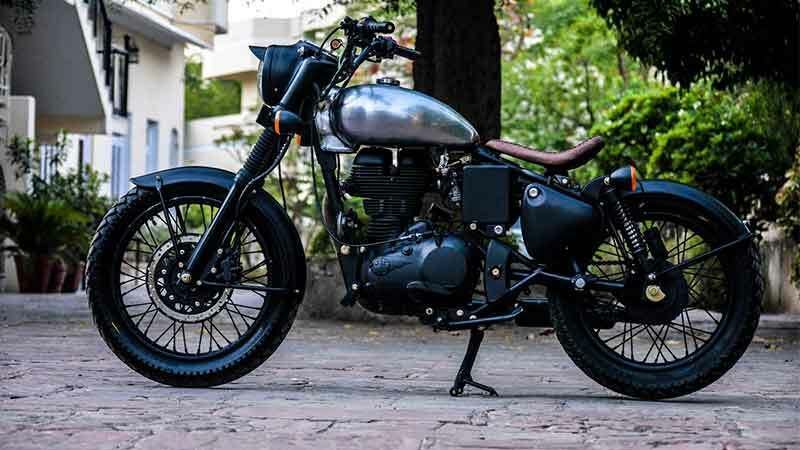 The Royal Enfield Classic 350 has been customized by the Dochaki Designs, a Pune-based custom bike builder. The bike has been transformed into a Cafe Racer called Maverick. 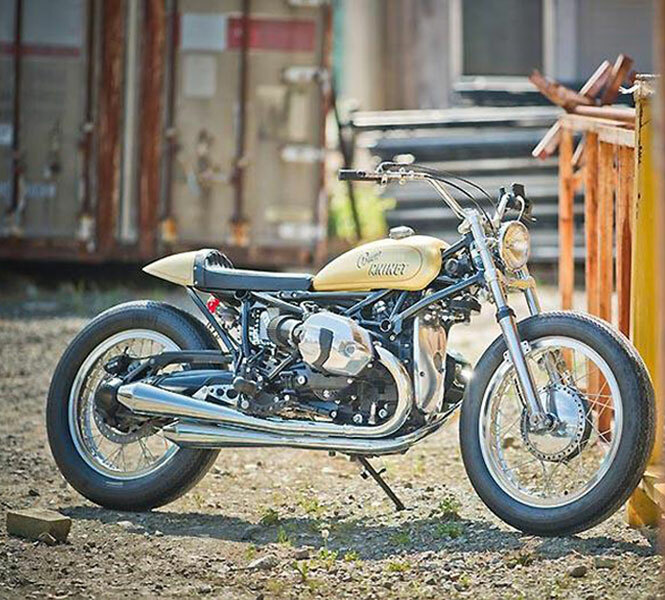 The design was insisted by an owner who wanted to get his RE Classic 350 customized. Dochaki Designs team worked for two months studying the new design in order to satisfy the owner. The swing arm has been extended to take larger tires and the chains, the linkage has also been modified. The chassis now offers a higher ground clearance with new mounts for suspension. The handlebar and seats have been reconfigured for increasing comfort level. The front mudguard has been tweaked for easy removal in case of offroading. The design team has also reworked on the paint job and offered the Maverick in different colour schemes inspired by the movie Top Gun. The world’s first completely Customized RE Himalayan was long awaited and now, the Inline3 Custom Motorcycles have made a comeback with their 5th customized bike aka Customized RE Himalayan. It has been built for South Delhi Motorcycles, the largest Royal Enfield dealership in Delhi, this Himalayan salt racer will also be one of their display motorcycles. 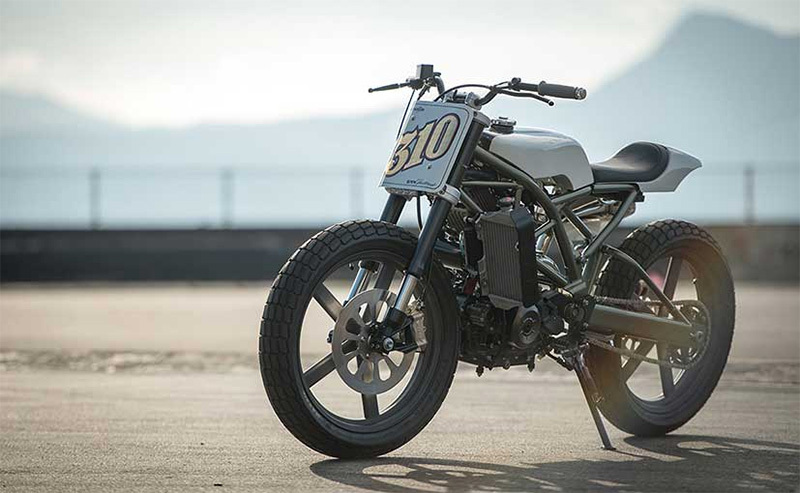 Inline3 Custom Motorcycle has managed to bring a kind of custom work that transforms the Himalayan into an incredible salt racer. The engine has not been tweaked but kept lightweight in order to maintain the performance at peak. The Royal Enfield Himalayan comes loaded with a 411cc single-cylinder, air-cooled engine that propels 24.5 bhp @ 6500 rpm and peak torque of 32 Nm @4000-4500 rpm. The streamlined bodywork is carried out in aluminium and the front forks get a custom stainless triple tree with build in gunmetal studs. The use of aluminium in the body has reduced the weight by 20 kgs comparatively. 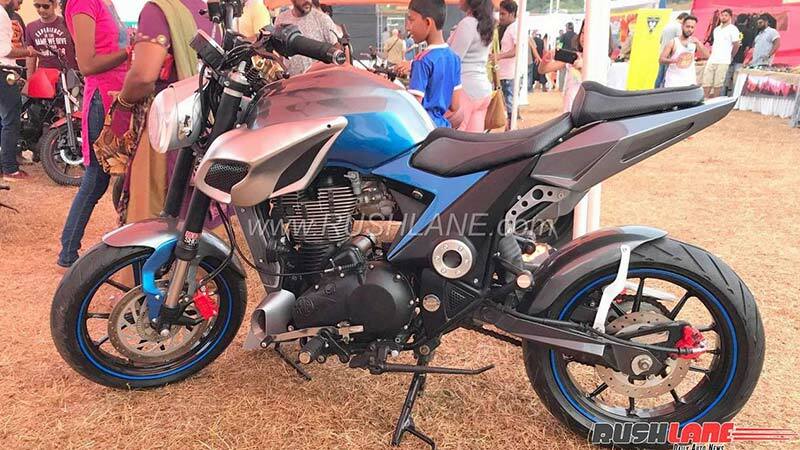 A beautiful modification has also been seen on the Bajaj 200 NS which is a naked street bike launched previously in 2012. 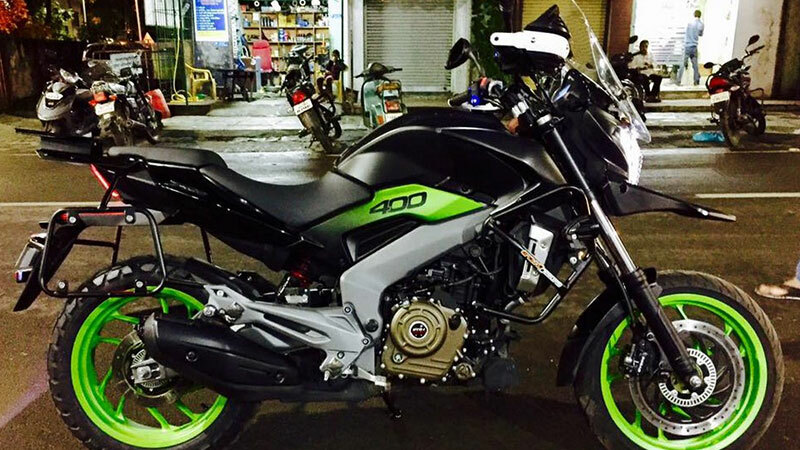 A Pulsar 200 NS owner back in Vietnam has given its bike a new statement and also supposedly made it much closer to the much reputed Kawasaki Z1000. 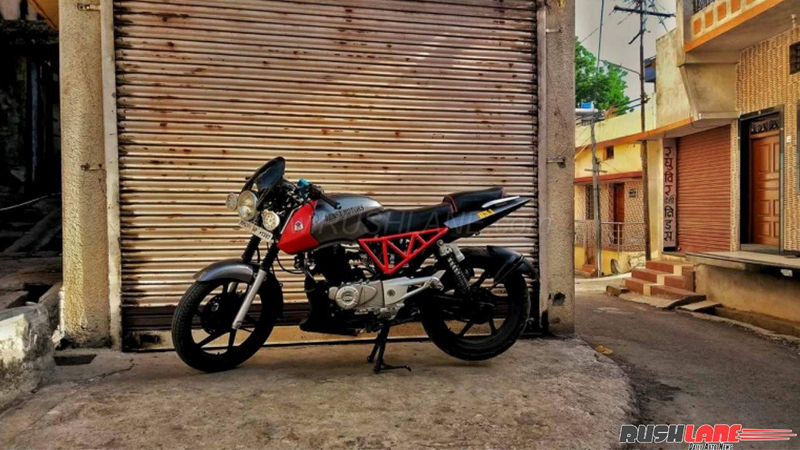 The bike is said to be tuned at 350cc and some newbies like LED headlamp, fatter 180 section rear tyre (standardly comes with 130 section), Brembo brake calipers, Austin Racing aftermarket exhaust system, trident logo in between the dual headlamp, restyled wind deflector, new instrument cluster, carbon fiber wrapped handlebar (no clip-on), new levers for front brake and clutch, sharper rear section, new seats, LED taillights, rear petal disc brakes and much more. 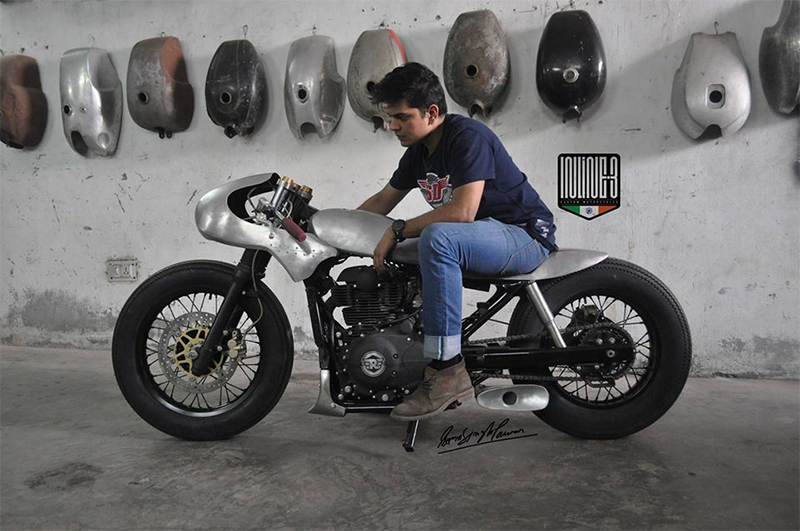 The custom bike builder, Rudy Gunawan of Indonesia modified a Bajaj pulsar 220F into a retro classic motorcycle. The motorcycle gets the livery of green and white colour combination. 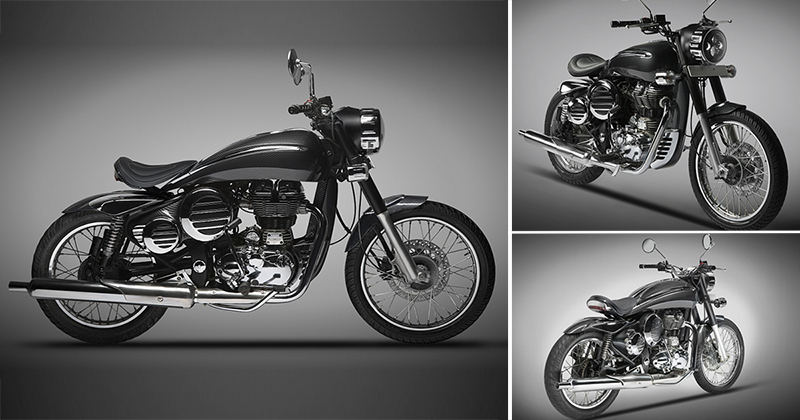 The overall customization which has been made on the bike to receive a retro classic form at the front and rear fender. The fuel tank replaced with the slender one and green coloured radiator shrouds with 220 stickers. Round shape headlamp and single piece seat which incorporation with the standard handlebar to give the comfortable seating and riding position. The large cylindrical exhaust and black colour alloy wheels to give it a complete retro classic look. From the all above, the main center of attraction is the green colour essence on the front discs and old days tail light with chrome casing. The speedometer is also being changed on this bike. The rear subframe of the Pulsar 220F has been replaced by the custom unit which is in the combination with a new swingarm. The performance and specification of the bike are discussing here. The Street 750 is one of the flagship products, released by Rajputana Customs. The bike is powered by a 750cc revolution v-twin engine which produces 59 Nm torque. The engine is mated to a 6-speed gearbox which rotates the rear wheel with the generated extreme power to push the bike in the forward direction. 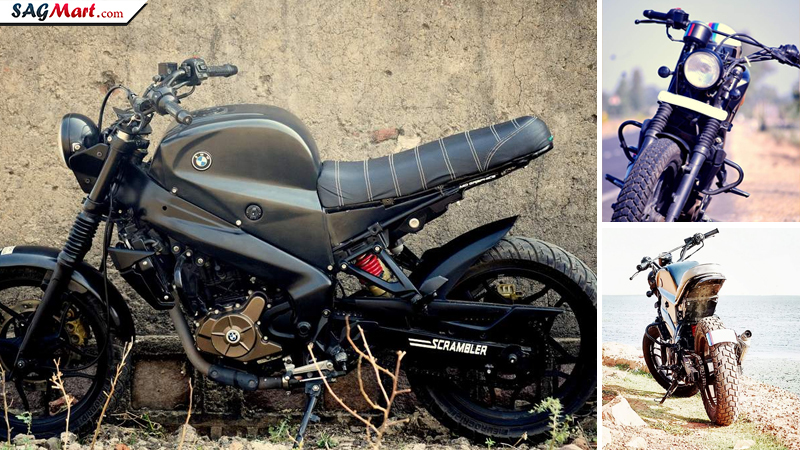 The customized Street 750 is wearing a completely different and swanky scrambler livery. Rich in charming components, the modified 750 carries mini round shape front headlight without any cowl covering and negligible tail section without any backlight. Well, proportioned handlebar with connected knotty Upside down golden colour front forks and fatty tires. Visible bigger engine and exhaust unit are also the noted components of the customized Harley Street 750. However, the offered higher seating position with a short handlebar are not valuable and comfortable for the long run. The spoke wheels are decorated with fat nutty tubeless tires with disc brakes for safety purposes. The BMW R Nine T is a born to customize motorcycle. The motorcycle is powered by an air and oil cooled version of the 1200cc boxer engine and along with that its manufacturer has given so many options to make your choice of R Nine T. A Japanese guy, named Go Takamine has given a scrambler look to the BMW R Nine T. The customized motorcycle is named as Cyclone and its creator has given a beautiful yellow color to the fuel tank of the motorcycle. The R Nine T has received many cosmetic changes, which includes raised handlebars, round shaped headlights, slim fuel tank, wire-spoked tires and newly designed exhaust tail. The Brat styled motorcycle’s most appealing part is its cafe racer styling seat. The Ducati 1190 Panigale has taken a new birth as a Cafe-Racer with the help of Gannet designs. The Custom-built company has come up with a single seated version of the Ducati 1190 Panigale and has used lots of fibre bodywork in the newly introduced motorcycle, which is known as Coffee-Fighter. Incorporating with the Ducati’s 1190 engine and the very same fuel tank, the Gannet designs has intensified the beauty of the motorcycle over its base design. The rough brush designed paint, seating style and newly designed alloy spoke wheels have made this a traditional Cafe-Racer. The Coffee-Fighter has received whole new fairing top tip to toe and its redesigned exhaust tail seems to be looking outside the window. The most popular and beloved cruiser motorcycle, Royal Enfield Bullet 500 has been made glorious and the toiling hands behind that belong to the Canada-based custom-builder, Motovida. The new livery received by the motorcycle is named as Royal Enfield Beach Bobber. The designer of the motorcycle is Brent Giesbrecht, who has given this motorcycle a whole new livery. The Beach Bobber has received fat tires, which is complemented by thin rear mudguard, single-seat, and attractively coloured fuel tank with a big RE printed over it. The over the cake is the hand-stitched saddle bag which has been attached to either side. With the displacement of 500cc, this air-cooled engine will give you an amazing riding pleasure and apart from that the name is enough to describe the overall look. Well, if you will have a closer look at this motorcycle, you will never come to know that this has been derived from the Hero Motorcorp’s flagship sports motorcycle, Hero Karizma. A completely naked custom-build Cafe-Racer motorcycle, which is derived by the Mean Green Customs based in Mumbai, Maharashtra. Well, the Cafe-Racer motorcycle has been carrying a head-turner look, but the most appealing part of the motorcycle is its silver-colored bodywork complemented with racing stripes all over the body. The front blinkers have been placed over the corners of handlebars and it has only one rear blinker just above the number plate, both of which are located on the right side of the rear tyre. The ducktail coloured leather seat and the rugged tyres without mud-guard also added a mild taste to the Cafe-Racer flavour of the motorcycle. The Mean Green Customs continued with the same technical specifications provided by the Hero Motorcorp. Yamaha R25 has become the most awaited sports motorcycle in India. Although, the official launch has been scheduled in the year 2015, but really can’t wait to witness the stylish performance of the upcoming motorcycle. 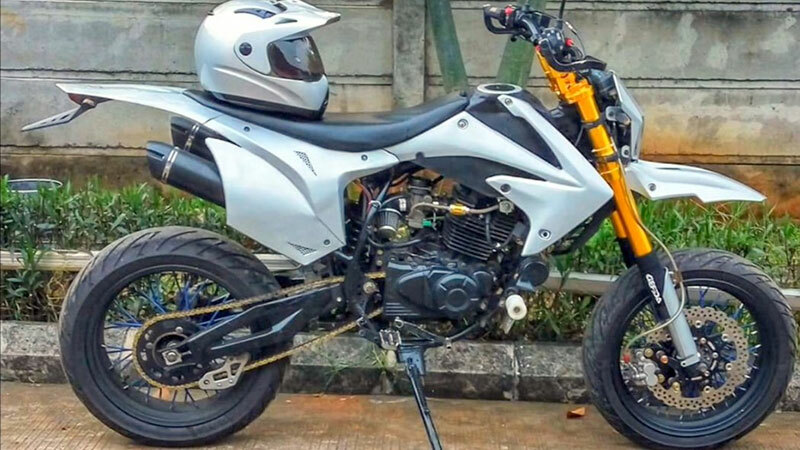 Yamaha R25 has been officially launched in Indonesia and they already have started modifying their most favoured motorcycle, not technically only cosmetically. Projecting the lights over the customization, which have been received by this quarter-litre honcho are the white-coloured three-spoke alloy wheels complimented by a colourful bezel layer, which has been done by the Berkat Motor. On the other hand, the Layz Motors have also tried their hands over this glorious motorcycle. The Layz Motors have painted the R25 in a pretty different manner; the shark-toothed front fairing with red-coloured eyes and alloy wheels. Well, they have made it an angry bird motorcycle as well. 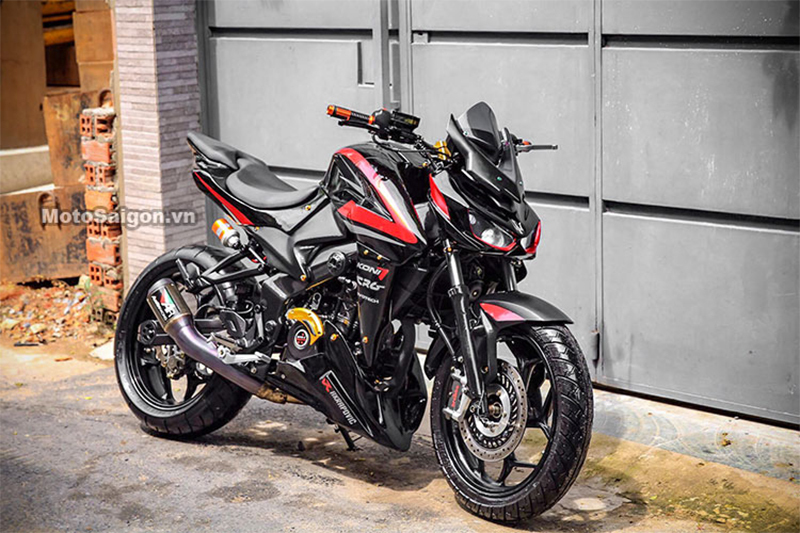 So these are some of the most popular customized motorcycle of the year 2014, which covers Bavarian’s R Nine T and Yamaha’s most awaited quarter-litre motorcycle, Yamaha R25 also. However, the story just doesn’t end here, we will be updating you more and more each passing day with the latest customization options to make your motorcycle look more glorious. Also, see the most scary customized helmets. Am Ns lover, awesome customized done Ns converted into Z1000. I want to do the same can i get the detail of the same customized company. Am from Mumbai. Love the Royal Enfield as well as the Hero Karizma (Hero-Honda Version).